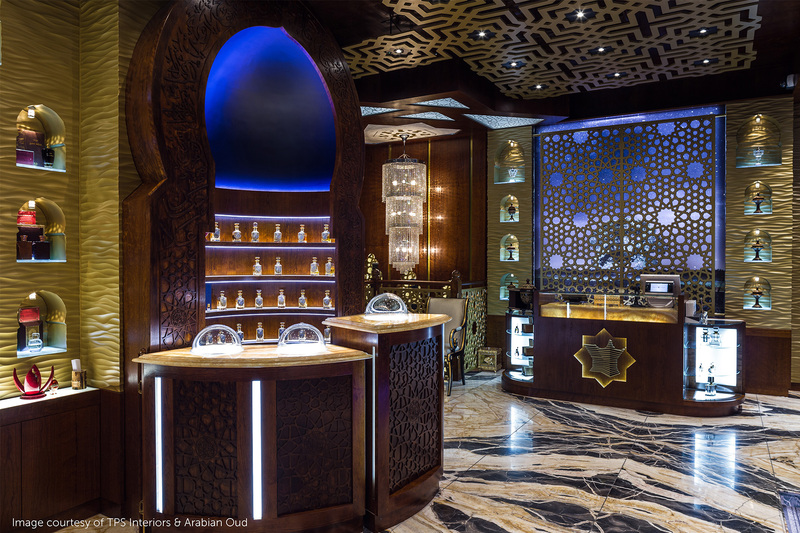 Arabian Oud is the largest Arabian fragrance retailer in the world, specialising in incense and oil perfumes. TPS interiors were tasked with delivering a full design and fit out for their flagship store in London’s Oxford Street and approached Bright Green for advice on how to illuminate the various different displays. We supplied custom sized LED Light Panels to backlight various displays however the real challenge was the centrepiece. In the middle of the store were large marble counters with sunk in bowls to display the Agarwod, a very dense, dark, resin embedded heartwood. This presented two challenges: Firstly the CRI of the lighting would need to be good enough for people to see the richness in the colour of the wood. Secondly the lighting needed to be slim enough to fit into the counter and bright enough to light the marble. Our solution – completely customised LED Light Panels with curves to fit the shape of the marble counter, holes to sink the bowl into and a completely customised grid structure etched onto the panel to ensure the lighting remained bright and even.